References XAP_App::getStringSet(), XAP_StringSet::getValueUTF8(), localizeLabelMarkup(), m_listEncodings, XAP_Dialog::m_pApp, m_windowMain, newDialogBuilder(), s, and s_encoding_dblclicked(). 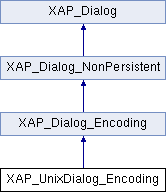 References XAP_Dialog_Encoding::_getAllEncodings(), XAP_Dialog_Encoding::_getEncodingsCount(), gchar, m_listEncodings, and s.
References XAP_Dialog_Encoding::_getAllEncodings(), XAP_Dialog_Encoding::_setAnswer(), XAP_Dialog_Encoding::_setEncoding(), XAP_Dialog_Encoding::_setSelectionIndex(), XAP_Dialog_Encoding::a_CANCEL, XAP_Dialog_Encoding::a_OK, m_listEncodings, and UT_ASSERT_NOT_REACHED. References _constructWindow(), _populateWindowData(), abiDestroyWidget(), abiRunModalDialog(), event_Cancel(), event_Ok(), and UT_return_if_fail. Referenced by _constructWindow(), _populateWindowData(), and event_Ok(). Referenced by _constructWindow(), and s_encoding_dblclicked().